Revision is hard. I get it. It’s really hard. It’s one of the top reasons I think writers quit writing and give up on ever getting published. It’s also one of those top reasons that writers end up insecure. After all, if you shared your first draft with someone, most likely all you heard was criticism or useless praise. 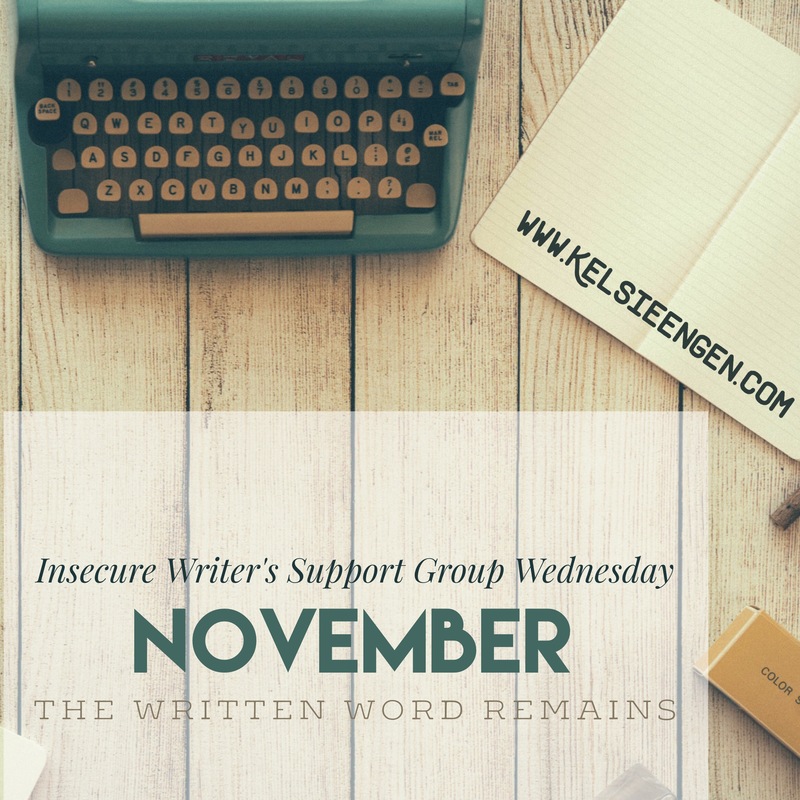 And because this is the first Wednesday of the month, it’s time for Insecure Writers’ Support Group–the first of 2016! So welcome to all those IWSG members here to commiserate with other insecure writers. If you’re here on your own and happen to be feeling a little insecure today, jump over to IWSG, where you can meet other real writers just like you, who might also have an insecurity or two. But let’s get back to the real subject today. And let me start by telling you a little secret: Every writer has to revise. No writer writes perfect first drafts. Even after multiple revisions, your story may not be ready to be published. But that doesn’t make it a bad story. That just means it needs a little more polish. That’s why I’m going to be talking about revision this month. Because it’s usually not fun, and it certainly doesn’t give you the “high” that writing does. But it’s absolutely necessary if you want to publish a book. A lot of people participated in National Novel Writing Month last November. I was one of approximately half a million people that attempted to write a 50K word novel in 30 days, and I was one of about 40K that won. Does that mean that my story is publishable? Heck no. Absolutely positively, no. And you know what? 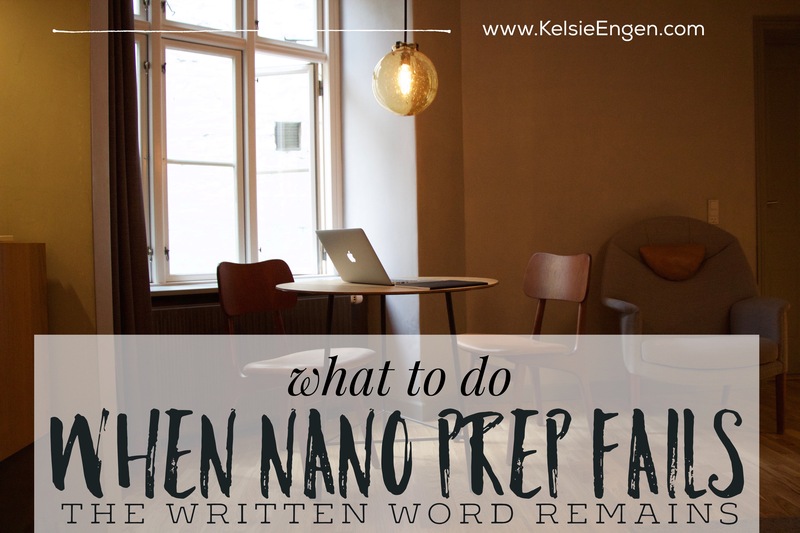 I actually used NaNo 2015 for a second draft–and that second draft still isn’t publishable. In fact, I anticipate at least two more rounds of revisions. One after my beta readers are done with it, and one after I get it back from an editor. We revise because it’s next to impossible to write a publishable first draft. (Now I say that assuming you haven’t written a 300-page outline prior to writing your 301-page book.) But writing is the fun part, the part where we engage our creativity and put down whatever enters our head on page 15 without a whole lot of thought for page 150. So when you do get all the way to page 301, and type “the end,” you may have a meandering pile of…well, you know. So what’s a writer to do? Revise. Because if you ever want anyone to read it and enjoy it, you’d best have a plot that doesn’t meander all the way around the block when you’re just walking next door. So we’ve established that revising is absolutely necessary. But how on earth do you start? I’ve learned the art of revision the hard way. I’ve learned it by rewriting my drafts until I was sick of them and finally gave up on some. I learned it by writing a frantically fast first draft (NaNo anyone?) and then realized that by pushing myself through that draft, I didn’t do myself a lot of favors. 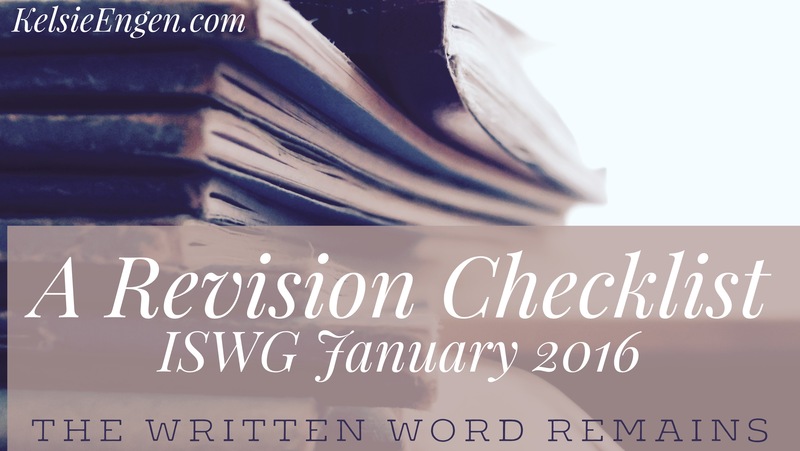 So over the years, I’ve created a revision checklist that I do every time I finish a first draft. If you start editing as soon as you type “the end,” you won’t have enough distance from the story to make your story better. The only way to get fresh eyes for your manuscript is to walk away from it for awhile. If you let it rest (weeks is good, months is better if you have the time), when you come back, you’ll be astonished at what you see. Perhaps it’s good astonishment, perhaps it’s bad. But you’ll see it with clarity you never would have seen had you started editing right after finishing your first draft. 2. Reread the entire book with minimal comments or highlights. This is the point where, after letting your book rest, you come back to the story and look at it with fresh eyes. Is there a gaping plot hole? Does your character have blue eyes on page 4 and hazel eyes on page 100? This is where you should be noting mostly the main things though, mainly concerned with plot and pacing. Does the first half of your book really drag? Or is it too fast and does the second part drag? Why? Is it because of that career subplot you have going on that doesn’t advance the plot and is forgotten halfway through the book? 3. Make the developmental big changes that need to happen. At this point it’s important to resist the urge to correct every sentence. There will be a time for that later. Right now, however, you want to get the plot and all the big stuff figured out. It’s possible that entire chapters will be cut, and you don’t want to waste a week making that chapter shine only to cut it later. Do pay attention to timeline issues, character development/arcs, character motivations, scene motivations, pacing, etc. 4. Repeat steps 1-3 until you are satisfied with the overall story and it feels strong. Yes. Repeat. Every step. Until you’re happy with the overall story. Only then should you move on to step 5. 5. Read each scene and go through with an eye for details this time. Here you don’t have to start at the beginning, nor do you need to let the story rest. Seek out clichés, over-usage of words, spelling errors, grammatical errors, etc., and make changes as necessary. Every writer has their “crutch” words, and they will probably be different for each story you write. But keep a list handy of the ones you tend to overuse (things like was, had, just, very, suddenly, among others), and cut them or reword them whenever possible. 6. Send to beta readers. Finally. This is what you write for, right? To share it with others? Well this is the point to get feedback. Share it with a small part of the world–a part that you trust so that you can make your story even better. 7. Work on something else. It’s best, while you’re waiting on responses, to work on something other than this story. Let it go for a little while so that you can face it fresh again after you get feedback (and so that the feedback doesn’t hurt quite as much). 8. Make changes from beta readers. Undoubtedly, if you chose your beta readers well, they will notice some small (or big) things that need to be changed. Make those changes–if you agree with them. If you don’t agree with them, and there are plenty of reasons not to agree with every reader, then don’t make those changes. Even after all these steps? I hear you asking. Yes. Even after all these steps, all these edits. You still need a new set of eyes–one that is trained to notice weaknesses and strengths in a story. Your editor, if you found a good one, should have plenty for you to change. Again, if you don’t agree with the edits, then don’t make the changes, or at the very least, question them. But you should weigh these edits with more weight than a beta reader’s. 11. Repeat steps 5-10 until your work shines. Yep. Repeat. You’re starting to hate me, aren’t you? Here it is, the point you’ve been waiting for. Find those agents. Send it out. Wait for your responses. It’s so simple, isn’t it? Obviously if you’re self-publishing, there are a lot of steps within this publishing point that you’ll have to tackle, but this isn’t the place to discuss that. Instead, at this point, you’ve done most of what you can (besides the changes your agent and editor want). Now it’s time to sit back and…wait. 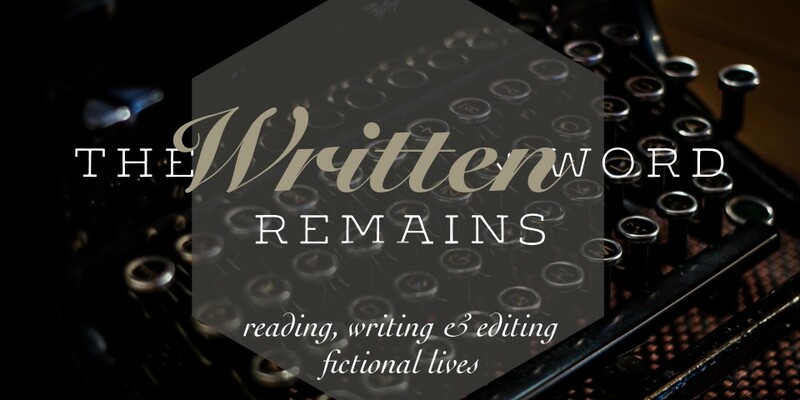 This month, I’ll be tackling revisions in a couple of my works, as well as discussing the subject on my blog. Revising is part of writing, and although I used to hate it, now I love to see how my work changes for the better after every revision. It’s encouraging to look at your novel along the way and see how far it’s come. No longer is it a diamond that only an expert would recognize, but it’s a polished, glistening gem that you’re proud to wear on your finger, around your neck, or in your ears. And, because you’ve spent so much time polishing it, it’s going to catch others’ eyes as well. 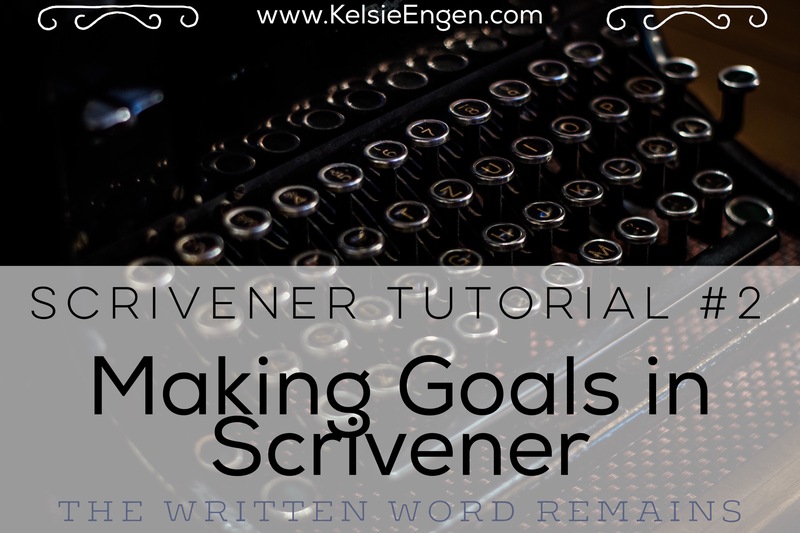 Did you know that you can create three different types of goals in Scrivener? Yep. Goals are a highly useful tool, especially during those NaNo days when your daily goal remains more or less unchanged at 1667 words a day. A project goal would be your overall word count goal for your entire novel. So if you’re writing a novella, or maybe you’re just working on NaNoWriMo and you have a 50K goal, that might be 50K words. If you’re attempting a full-length novel, then perhaps 80-100K. Epic Fantasy, well…you’re probably way over that. Default goals are 0 for both Manuscript Target and Session Target. Below, I’ll tell you how to adjust both these goals and explain what they are if the names don’t already tip you off! In order to change your Manuscript Target, simply click on the default 0 and enter in the number that you wish you reach with your manuscript. A good number to aim for with an adult, general fiction novel would be around 80-100K words. Anything lower and your book might be considered too thin and in the “novella” range, and anything higher could probably do with a good edit. Try to stay under the triple digits if you can (this is sooo hard for me!). Now as you write, the bottom, “session target” bar will fill in from red to orange to green as you write toward your goal. Don’t sweat it. Options are really just a way to pump up your goals. Go ahead and press the button, don’t be scared. Nothing will change unless you want it to. Got it open? You should see something like this (below). Your first two boxes should be checked. That’s okay, that’s default. I hear some of you asking, “What does ‘compile’ mean?” Compile is something neat about Scrivener. Compile is what Scrivener calls it when you add the file you’re working on to the document you want to export or count in your manuscript/session target. Confused? Here’s a picture to help. Make sure your Inspector is showing, it’s the icon of a blue circle with the white, italic i in the center. Okay, so in your Inspector, you must locate the middle section, called “General,” below the “Synopsis” section and above “Document Notes.” If that section doesn’t show anything below it, or goes directly into “Document Notes,” then click on the arrow to the left of “General” and you should see something like what I have pictured for you. If the document you’re working on is part of your novel and you want it counted in your Manuscript Target, make sure that “Include in Compile” is checked. The other two options, “Page Break Before,” and “Compile As-Is” don’t really matter right now, so don’t worry about them. Okay. Now that that’s checked, anything you type in that document will show up as words typed for the session and manuscript. Now that we’ve figured out what “compile” means for our usage today, let’s talk about the other Project Target options you have. This is awesome. Pure awesome. Say you want to participate in National Novel Writing Month (NaNoWriMo) like we just did last month in November. Yep. Those. Okay. Now you have a few things you can change. The first is the “Deadline.” Click on that–then you can change the date. If you want to write 50K in 30 days, then set your deadline to 30 days from today. But don’t close the window just yet. Instead, go down to the last box and click it, the “Automatically calculate from draft deadline.” Then select what days of the week you want to write on, and I like to click “allow writing on day of deadline,” especially if it’s a NaNo event. 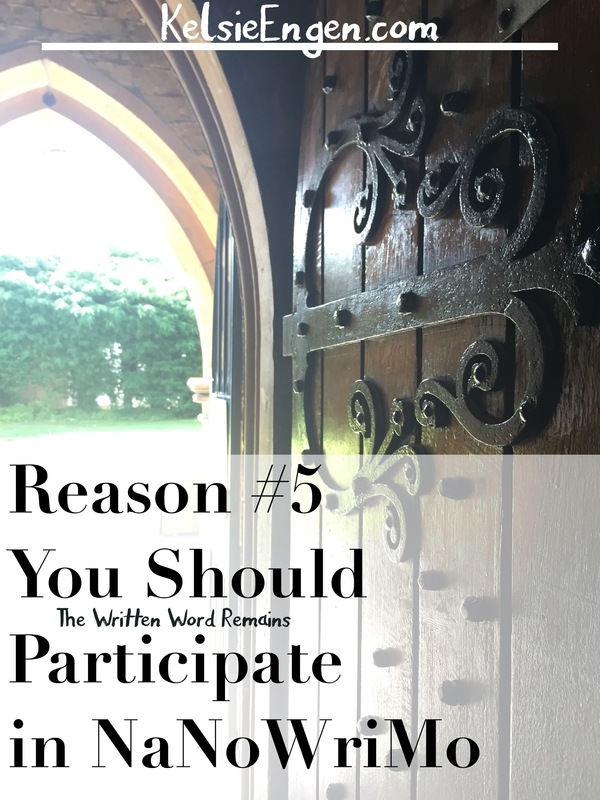 So if I were to begin writing 50K right now, at the point of writing this blog entry, I would have to write 1428 words for 35 days in a row to achieve that. But what if I wanted to make that a solid 30 days? Just open up “Options…” again and change to 30 days from today. Okay. Now I’d have to write 1666 words for the next 30 days to write that 50K. Sound familiar? Lots of you just achieved that average over the month of November! The awesomest (Yes, I’m well aware that isn’t a word you find in the dictionary, thankyouverymuch.) thing about Scrivener’s Project Targets is that they recalculate themselves. Say I only wrote 1233 words today and called it quits. You would then see that you have the same deadline, but you have a slightly increased number of words to average for the rest of your days in order to reach the 50K goal you’ve set for yourself. There are a few other options that you have here in Scrivener as well. I believe automatically selected is the first, which automatically resets your word count at midnight. This means that Scrivener gives you a 24-hour day to reach your session target. If you were to type over the midnight hour, you’d see your session target automatically roll over, even it were 12:01 a.m. The third is again what it sounds like: your session target will reset when you open your file on the following day. So if you close it and open it again that day, your session target remains unchanged for that day. Slightly different, but distinct from the second option. The fourth option is one that I’ve used, and if you keep track of your word count in another file, I recommend. The only trick is to remember to click the “reset” button before you begin typing the next day. Okay, now we’ve finally gotten to the last kind of goal that Scrivener offers (to my puny knowledge). A document goal would be used for a scene or chapter that you are writing, in other words a partial goal for your novel, as it is only visible when you are in that particular document/scene where you see your words and characters for that scene. Yes, that little target all the way to the right. In order to locate and edit your document goal, go ahead and open up a scene you’re working on. Then take a look down at the lower right hand corner and look for a little target. Now what you’ll see at the bottom of the page is a rectangle to the left of the target. As you type, the rectangular box will fill up and the color will change from red, to orange, to green as you type toward your goal. What I love about it Scrivener’s document goals are that they are not affected by the daily goal target you are trying to meet. Note: If you check the box “Show target notifications,” a popup will appear from the side of your computer that notifies you of reaching your document target. Shoot me a question in the comments below and maybe I can help! This week marked the beginning of National Novel Writing Month (NaNoWriMo). Which means, for you uninitiated, that those of us who participate are busy trying to write our fingers to the bone and write 50K in 30 days. For those of you keeping track, we’re already 8 days in, and should be about 13K in. For that reason, I’ve reduced my number of posts for November, to every couple of days, while I attempt to keep up with the demands of such a writing schedule, in addition to every day life. I hope you all have enjoyed a productive week and are ready to face a second week of mad writing. 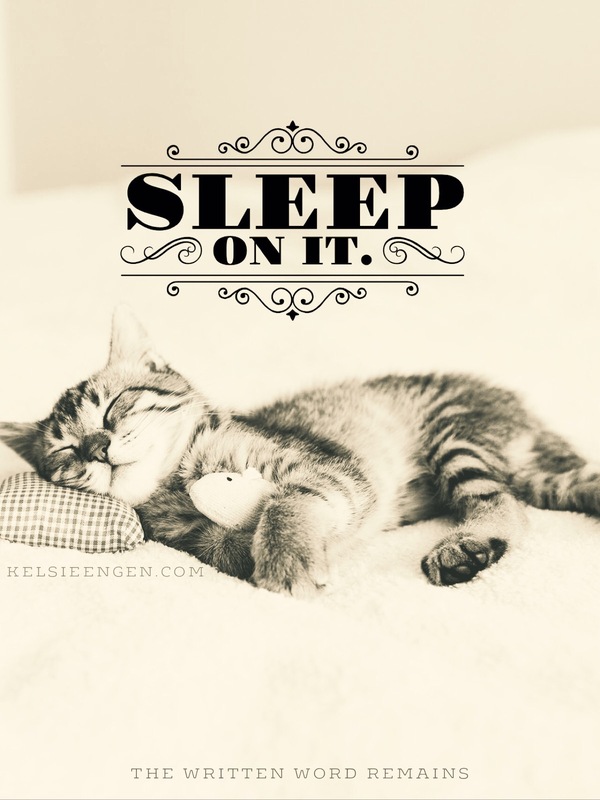 In the meantime, I’m going to be attempting to maintain my 2500 word a day average, but you may find me on Twitter or Pinterest searching for inspiration (and my sanity) as the month progresses! Thanks to a courteous fellow IWSG blogger for the stop by on my other blog post today where I discuss the writing software Storyist. Interestingly enough for IWSG Wednesday, writing software has been one of those things that finally made me feel like a “real writer.” Writing in Word is fine, and cheap, and anyone can do it. 😉 But investing in a software specifically for the craft of writing can make you feel like a true writer and could possibly ease some of those insecurities you might feel. In my experience, investing in any hobby can validate your craft and encourage you to turn it into more than a “hobby.” In some ways, it guilts you into using the purchased item just to get your money’s worth. Writing software like Storyist or Scrivener can make you feel less like an amateur and more like a professional. After all, tools made specifically for an art are usually infinitely better than trying to adapt a generic tool to a specific craft. When I finally took the plunge and invested financially in my writing, I began to feel less like a wannabe and more like a “real writer.” This investment was an investment in myself a way to affirm to myself what I wanted to do and to acknowledge that I was more than a wannabe. But should you do it? What one one writer finds useful another can find distracting, and plenty of pros also use Word. The most important thing is to find a tool that works for you and stick with it, getting the words down on the page. Tell me in the comments below: how do you record your stories? Have you splurged on writer’s software and do you use it? You forget everything. The hours slip by. 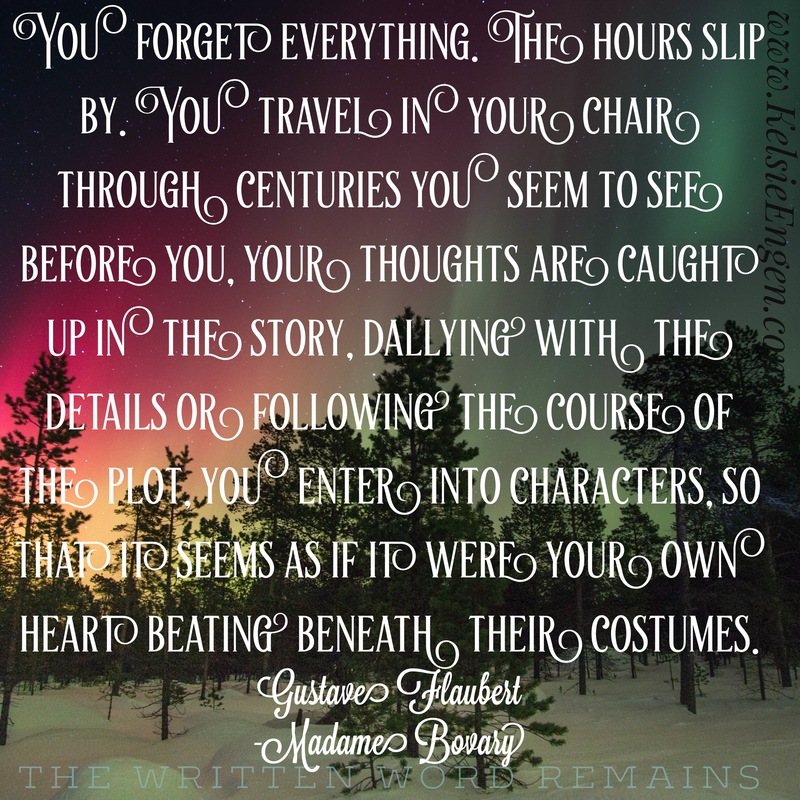 You travel in your chair through centuries you seem to see before you, your thoughts are caught up in the story, dallying with the details or following the course of the plot, you enter into characters, so that it seems as if it were your own heart beating beneath their costumes. Oh, how true. As writers we slip into that spot where we lose track of time and get trapped in the stories of our mind. I hope this is you, as NaNoWriMo progresses. Best of luck to my fellow writers out there. Feel free to comment below with your word counts and how you’re nailing your novel! After all my NaNo prep the past couple of weeks, there’s one thing I forgot to do: prep for my own NaNo novel! It’s absolutely my fault. In fact, I have been trying so hard to finish the second draft of my novel, Spurn the Moon, that I’ve put off all other writing in order to do so. I was hoping to have it finished by the end of October, but it’s not going to happen. I just got too wordy with it and scenes that I didn’t expect to expand did just that. So what do you do when all your prepping (or lack thereof) fails you? This is really the basic step necessary before you can even outline. What do I want to write about? Who are the characters? What is the story? I need to consider the tone I’m aiming for, the theme I’m trying to convey, maybe even what subject I want to focus on. But I need more than a topic, I need a story. I need more than a setting, I need a story within that setting. True, great stories can begin with either a topic or a setting, but it has to go beyond that, and that’s where brainstorming comes in. So pull out the journals and pens and start scribbling however you brainstorm best. Lost? Here’s an article on different methods of brainstorming. So maybe you’ve brainstormed all you need to now and you have more than enough ideas to fill your pages. We’ve all been there. You’ve got a thousand ideas and you only needed one. Maybe it’s time to focus on characters now. Choose your best idea(s) and consider what kind of character will be best for that scenario. Do you need a demure woman or a kick-@$$ hero? What do they look like? What do they act like when they’re confronted? Or when their friend (or enemy) is being passive-aggressive with them? How do they act with kids? When I’m struggling with a character, or even struggling to come up with a character at all, an interview can work wonders to pull out information from them. Sit down with them and start asking questions. If you’re struggling with a certain scene, this can work wonders for giving you insight into their mind and writing yourself out of a block. Here’s another link from K.M. Weiland with 100+ questions for your character. Give it a try. Tell me how it works for you. For me, outlining is something that has to happen once the general idea is in place. Once I know my characters, the story I want to tell, and roughly how I want to tell it, then I can outline, not before. After I’ve brainstormed my ideas, figured out my characters and given them names, then I can start thinking about hooks, inciting events, plot points, climaxes, and resolutions. Only then can I understand how my character fits into these scenarios. It’s at this point that I try to make the structure of my novel as strong as possible and begin to put plot points in order. Confused about plot points? Check out K.M. Weiland’s excellent blog posts on story structure. Say you’ve already done the above and you’re really just facing writer’s block. You know what you have to write, and even how you have to write it, but you just can’t write it. Something that really loosens my inner writing cogs is to summarize the scenes I know I have to write. There is less pressure about writing a summary of a scene than the scene itself. You don’t have to get the words right, you just have to get the actions right. Give it a try. Let me know how it works for you. Everyone likes to win, right? The number one reason for not starting something is fear of failure. We don’t want to seem incompetent so we don’t try. Or we make fun of it because we secretly feel like we can’t measure up. Well, allow me to let you in on a little secret. Ready? Here goes. Even if you write one sentence this month of November, you’ve already won. But even if you only write halfway to your goal in NaNo, you’ve written thousands of words. That’s thousands into your novel or whatever project you’re working on. That’s reason enough to join NaNo. Letters & Lights and the proud sponsors of NaNoWriMo do you one better, however. Did you know that every National Novel Writing Month winner receives “winner goodies”? And we all know that goodies are a great thing to motivate you to get that book finally written–or at least 50K of it. Each year winners are offered a special assortments of goodies, all pertaining to the writing craft. Usually these are discounts on software such as Scrivener and Storyist, or Timeline software Aeon. There is also the possibility of a discount from BookBaby or other self-publishers. When you validate your NaNo novel, you thus get all sorts of bonuses. And it’s almost time to start. So get over to NaNoWriMo and sign up before you’re too late and you let another November pass you by! What is 30 days of your life? If you live to average life expectancy, you have 78.8 years on this earth, according to the CDC. (And some say the next generation will live to be much older.) Let’s round up and say you have 79, which means you have 28,835 days on earth. NaNoWriMo lasts for 30 days. 30 days of 28,835 is less than 1% of your life. Is that too much time to spend writing a novel? And that were if you spent every second of those 30 days writing. NaNoWriMo doesn’t ask for your every waking moment of November–although it can easily become that obsession as you eat, breathe, and sleep writing your novel. It does ask for a big chunk of time in what may be a frantic life. But what does this have to do with reason #4: experiment? Well, in my experience, experimenting can be a costly business. It’s a gamble, after all. And who wants to was time and effort on a gamble? You fear wasting time, effort, money, brainpower–whatever it is. But 1% of your life is not that much. 30 days are not much time to “waste” experimenting. With the course of NaNo spanning only 1% of your life, what is holding you back from experimenting? Indeed, the true waste of time is not writing at all. So what are you waiting for? Get over there and sign up! Many writers find it challenging to turn off the “inner editor” while writing. What is the inner editor? Well the inner editor is what slows you down. This can be a need for perfectionism which makes you doubt every word you write or a need for a typo-free, plot-hole free first draft. Essentially, the “inner editor” is the need to edit while writing. Because no one writes a perfect first draft, your self-editing mechanism kicks in when you review what you’ve written. But really–who wants a perfect first draft? Okay, I might be the first in line for that. But if you consider, sometimes it’s the rabbit trails of a first draft that deliver some of the most promising plots or subplots for a writer to develop in the second draft. Outlining is great and all, but sometimes the greatest epiphanies occur while in the act of writing. No matter how much I outline, my first draft always deviates from it and surprises me. There is always some new idea I get while writing the first draft that never occurred to me while outlining. Writing is the more creative act, outlining analytical, so it makes sense that creativity flows while writing and not outlining. While there is a focus throughout October and earlier on coming into November’s event as prepared as you can be through outlining and research, once November dawns, it’s all about numbers. A lot of writers may not like this approach, and I can easily see why. Who wants to be purposeful about writing crap? But it’s because NaNo promotes “quantity over quality,” that it is such a great opportunity to learn to turn off that inner editor and indulge your fancies. NaNo gives you full permission to write that crappy first draft you’d otherwise be ashamed of–and get full marks for it. As long as you write those 50K words, you win. So this November, indulge your character’s desires for rabbit trails and sheep paths and meanderings through the woods. There’s no better time than now!